Why are African Greys such desirable birds? If you love birds, you will surely love the African Grey – an ‘old world’ parrot with a history dating back over 3,000 years. With its intelligence, striking good looks and propensity to talk, there is so much to appreciate about the species. Both the Congo and the Timneh, two distinct subspecies, are common household pets today, although there are a couple of discernible differences between them. The Congo is bigger, brighter and more aloof, while its cousin the Timneh is smaller, darker, has tail feathers ranging from maroon to dark grey, and a friendlier disposition. Both originate from Africa, hence the name, are listed as ‘vulnerable’ in the wild and have a long life expectancy of 40-60 years. But where did the African Grey come from? Evidence suggests a very antiquitous history for the bird we all know and love, with some dating its existence to the time of the Ancient Egyptians. Based on records from 3000 BC, it is evident that parrot-type birds were the companions of choice for royalty who had them caged in gilded aviaries of elaborate design. Chinese pottery from the third century AD depicts a similar scene in which exotic birds were housed in bejewelled cages by the wealthy and royal. Chinese culture very much revered the bird as a symbol of good-fortune and those that sang and talked were often taken around in small travelling cages. 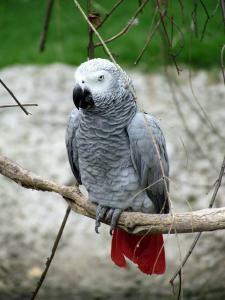 The African Grey’s intelligence and natural ability to learn language made it a popular choice for this activity. Similarly, in ancient India, parrots like the African Grey were considered ‘birds of love’ and teaching one to talk carried a romantic notion. In fact, a man with a talking parrot was seen as a ‘good catch’ in Indian culture, worthy of female devotion. The parrot also appeared in traditional fables as a symbol of reflection and understanding. At some point of other, possibly through climate change, birds like the African Grey migrated to more hospitable countries such as Asia and South America. This is thought to have happened 1.5-7 million years ago, based on fossils found in the regions. That said, a fossil discovered in Nebraska – believed to belong to the now-extinct Carolina parakeet – was dated 20 million years ago! Bearing in mind the earliest parrots emerged some 40 million years ago during the Eocene Epoch, it is possible the African Grey is one of the oldest birds on the planet. Today, the African Grey is one of the most common household birds on account of its unique abilities and appearance. Many owners will no doubt tell you about their Grey's amazing intelligence, awareness and ability to learn new skills, whether it's mimicking speech, responding to its care-givers and environment, or teaching itself new tricks. The long life expectancy of these birds also appeals to many people as they know they will have their beloved bird for many years to come! my African Gray is called Merlin he's 18yrs old now I've had him since he was 8wks and is loved by everyone he could talk the hind legs off a donkey (as they say) he even talks to my husband on face time when he's away! He loves feeding the dogs he tells them to sit stay and wait until he's ready to give them a treat (and they do!) the only thing he really hates is me dusting he'll keep screaming or mimking a magpie which drives me mad .but I love hin anyway.